Is your child crazy after reading magazines in his free time or loves solving word search games and puzzles in his free time? Then buying him an annual subscription of the Junior Wordsearch Fun magazine is the ultimate gift you can give him on his big day or on any other occasion of his life or when he gets an achievement in school. 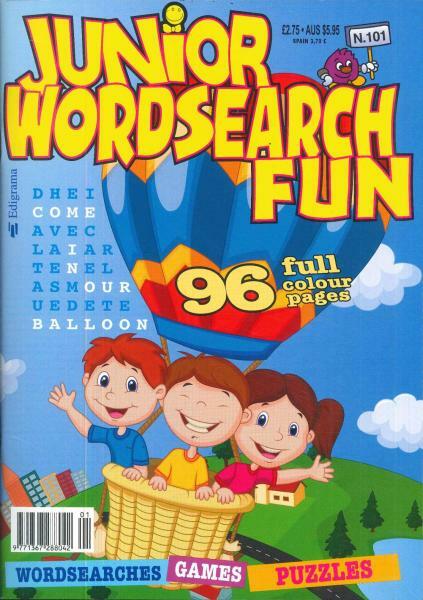 Buy a single copy or subscription to Junior Wordsearch Fun magazine. It will probably be the best gift he will receive and even give you the satisfaction that your money is well spent as the Junior Wordsearch Fun magazine also provides educational knowledge apart from just entertainment and fun. The Junior Word Search magazine is a 96 pages magazine filled with colorful pictures and lots and lots of puzzles which children have a great time solving. Children really find it fun and stimulating when solving the crosswords and puzzles. The Junior Word Search Fun magazine has the perfect mix of puzzles and games which also helps to develop the thinking capacity and improved vocabulary of your children.